After a long and dark decade during the Group C-dominated 1980’s, the noble art of GT racing finally saw a return to the forefront of motorsport in 1994, with the formation of the BPR Global GT Series. Since the immensely popular Group C machines and the World Sportscar Championship had succumbed to a dubious new engine formula and questionable financial decisions by the FIA, prototype racing was all but dead. In the vacuum that resulted from this collapse, German Porsche Cup organizer Jürgen Barth formed a pact with Venturi Cup top dogs Patrick Peter and Stéphane Ratel, to form a new series based around mildly modified road going sportscars. In the first two seasons, this throwback to traditional GT-racing provided a proving ground for an ever-increasing field of various sportscars. Initially the grids were made up of entries from the two Cup series that spawned it, but soon efforts from Lotus, Chrysler, Ferrari, McLaren, Lister and Jaguar joined the fray. The diverse field propelled BPR Global GT to new heights. With more and more entries lining up on the grid, and a fantastic range of cars on display, BPR was rapidly becoming a fan favorite. Nowhere else could they see their favorite bedroom-poster supercars go head to head in fiercely competitive battles. 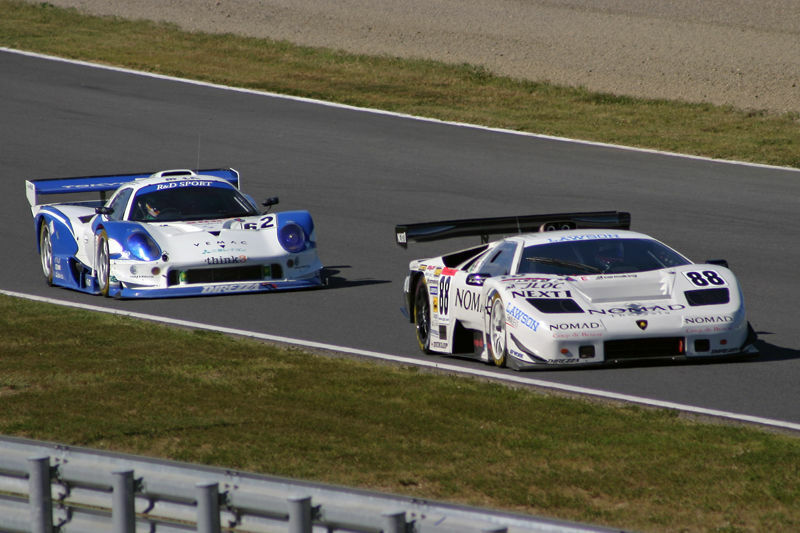 The biggest duel of all was between the venerable Ferrari F40 GTE, and the still relatively new McLaren F1 GTR. Left at the back were German racing legends Porsche, who had been campaigning desperately upgraded versions of GT2-spec 993 machines. Frustrated at their lack of success, they turned to the nuclear option. Porsche found a gap in the homologation requirements for GT1-cars, which stipulated cars were eligible when only 25 examples had been produced for road use. The extreme 911 GT1 took the series by storm. Seeing a way out, the eager Germans turned the rules upside down and made a bespoke racer, which also happened to be road legal. The monstrously fast 911 GT2 born from this mantra quickly dispatched the more conservatively tuned establishment, and fired the opening shots in a looming homologation war. Following the 911’s debut late in 1996, several rivals jumped on the opportunity to conquer the one of the most popular championships on the planet. As Lotus, Panoz, Mercedes-Benz, Callaway, Nissan all sharpened their knives for a 1997 assault at the newly renamed FIA GT Championship, and Porsche and McLaren fortified their chariots for their arrival, another small-scale project was being launched. Lamborghini had always been about extravagance and style, racing was never a priority. While witnessing the meteoric rise of the 911 GT1 during the 1996 season, Italian supercar specialists Lamborghini decided to try and take a slice of the lucrative new pie. Since 1994 the company had been under the ownership of shady Indonesian firm MegaTech, formally based in Bermuda and co-owned by Tommy Suharto, son of dictator Muhammad Suharto. MegaTech owned both Lamborghini and American sportscar firm Vector, and was seeking to further the image of both brands through the noble art of motorsport. Since the Indonesians had little understanding of the inner workings of a racing car, they decided to sub-contract the design and fabrication work to an outside source. The massive 6.0L V12 provided plenty of power. To this end, Lamborghini contacted French specialists Signes Advanced Technology, and laid out the plans. SAT was to construct a completely new machine very loosely based on the Diablo, and received permission to use whatever parts and methods they deemed necessary. Lamborghini on the other hand, would take care of the engine. The GT1 Stradale's cozy cabin. With the engine finished, SAT set about designing a car around it. In classic fashion, the car was made up of a steel tubeframe chassis, clad in vastly more modern carbon fiber bodywork. From almost every angle, the incredibly long and wide beast had nothing in common with its namesake. Apart from the iconic doors and the legendary engine, the GT1 had very little in common with its lesser sisters. Gone was the distinctive raked rear-end, replaced by an enormous, one-piece clamshell incorporating huge intakes for the hungry V12, and four large vents in the rear to let the heat of the monster back out. 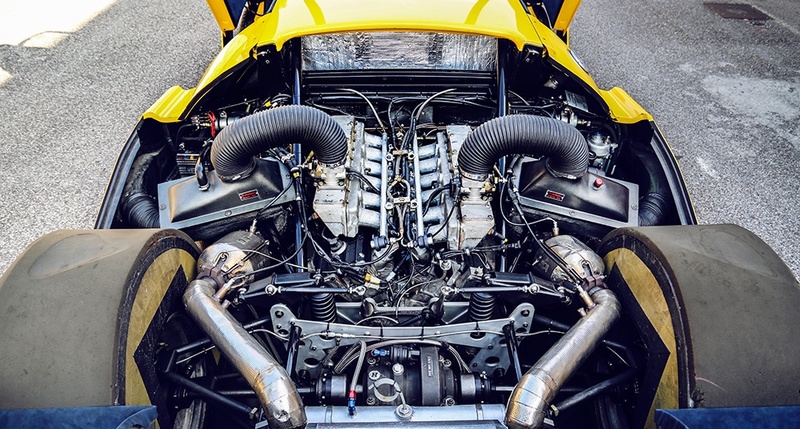 In addition to the drastically stretched silhouette, the GT1 featured a plethora of intakes and vents designed to carefully manage the air moving around the car. The package included a large rear diffuser, a one-piece nosecone with a substantial front splitter, and more aerodynamic fixed headlights set behind plexiglass. Everything about the car looked purposeful and effective. Unlike most Lamborghini’s, there was not a single feature to be found that wasn’t absolutely necessary. On the technical side, SAT married the V12 to a Hewland TGTA-200 6-speed sequential transmission operated from a large gear lever in the center console, and mated it in turn to a triple plate carbon clutch courtesy of AP Racing. AP was also responsible for the 6-piston brake calipers at the front and 4-pistons at the back, with steel discs by Brembo. Michelin meanwhile supplied 275-section racing rubber on the front axle, with 345’s on the rear, wrapping up 18-inch multi-piece OZ wheels. Despite the impractically large jerky sequential shifter, the Stradale still had room for creature comforts. When all was said and done, SAT was left with a 1050 kg (2314 lbs), 655 horsepower sequential shift, air-conditioned road rocket. Appropriately named the GT1 Stradale, the car would serve as a proof-of-concept to be presented to FIA officials in the hopes of gaining homologation for the racecar. In April of 1997, the car was finally finished, and shown to Lamborghini’s big wigs. However, the company had since fallen into dire straits after financial mismanagement by the clueless morons at MegaTech, further exacerbated by an economic crisis that swept from Asia in the summer of 1997. Funds were drying up at an alarming rate, leading to the cancellation of the already problematic Vector M12 production and the eventual sale of Lamborghini. When German luxury brand Audi AG took over in September 1998, the Italian Ministry of Transport had already declared the GT1 Stradale officially road legal, which was followed by an FIA announcement granting homologation to the type. Audi had different interests however, and decided not to pursue the project any further, instead focusing of the development of the GT and GTR club racers. The Diablo found a second lease of life overseas. The story didn’t quite end there though, since SAT had taken the liberty of constructing a second chassis. Unlike the first example, this car was to be a dedicated racer. SAT prepared the GT1 for the racing department of the Japanese Lamborghini Owners Club, which had been using Diablo Jota’s and GTR’s in the All Japan GT Championship. To prepare the Diablo for its harsh life down East, SAT fitted it with a large adjustable rear wing, a fully functional diffuser, a revised outlet on the front bonnet and reduced the number of engine intakes to one to account for the use of intake restrictors. In this guise the mighty V12 produced just 542 horsepower, only slightly more than the production model. Nevertheless it was still the most powerful GT500-class car in the field. The Diablo faced daunting opposition from Japan's three major factory teams. Operating in the top-level GT500 class, the Diablo was forced to deal with Japan’s Big Three. Toyota, Nissan and Honda all three fielded thoroughly prepared and several cars strong works entries, making life difficult up top. Against such meticulously designed vehicles in alien surroundings, the big bull had a difficult time adapting. The NOMAD Diablo was subject to continuous development. Throughout the years JLOC Corsa worked hard to develop the car and catch up to the factory teams. 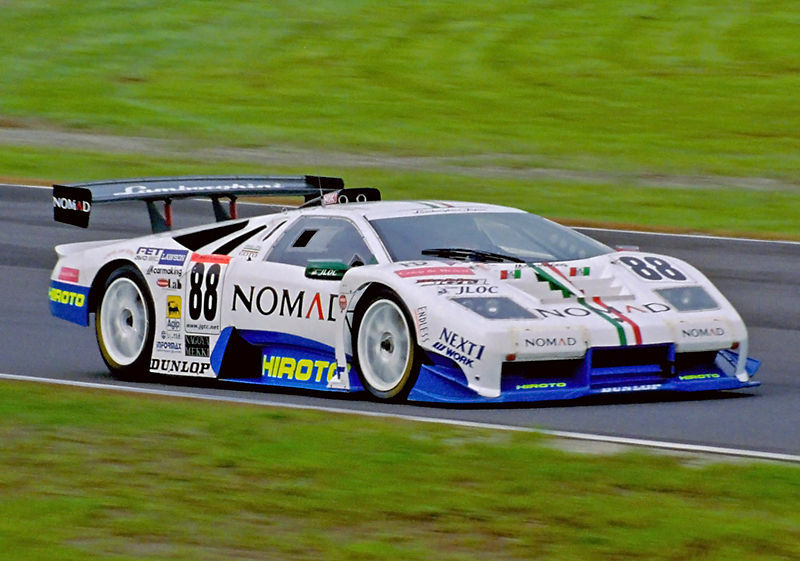 Its debut season in 1998 saw the car finish only two times, with a best finish of 9th at Hi-Land GT Sendai. The following year was even worse, as the car couldn’t finish higher than 15th at Motegi, while racking up a string of wheel, driveshaft and shift linkage-related retirements. While the car struggled to keep pace with the front runners, it quickly won the hearts and minds of many Japanese racefans. 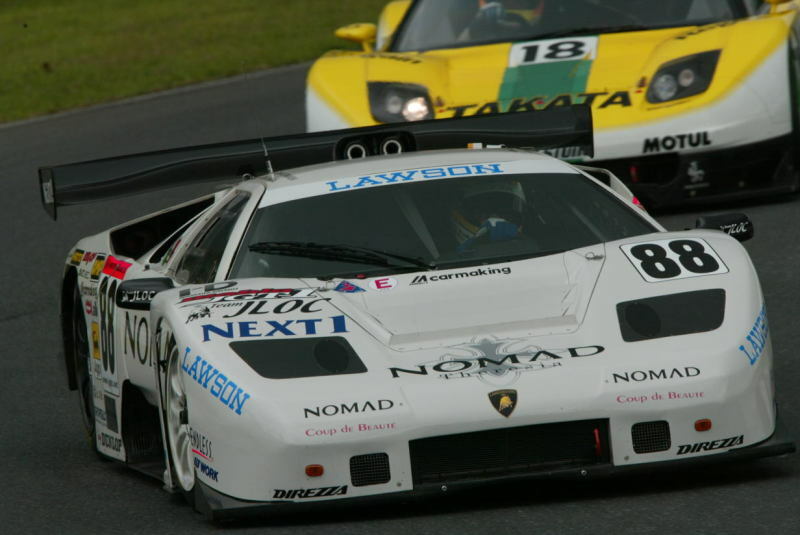 Its unusual appearance and savage sound were unique in JGTC, making the Diablo a real crowd-pleaser. Predictably, the Diablo never really got up to the level of the corporate superstars that dominated the series. Although it showed flashes of speed, and was the most powerful machine on the grid, JLOC Corsa simply lacked the means to make it a real contender. Frequent mechanical issues often sidelined the car, and its elongated slippery shape intended for the long straights of Le Mans, was ill-suited to the tight and twisty tracks of Japan. JLOC heroically stood by the Diablo GT1 until the very end. Despite these flaws, JLOC Corsa stuck with the car until 2004, when the new Murcielago R-GT engineered by German outfit Reiter Engineering became available. Even though the car was never the success JLOC hoped it to be, it kept the spirit of Lamborghini alive in Japan, as it made for a great promotional tool. There was not a single petrol-headed Japanese soul around who didn’t know about the big bellowing V12. 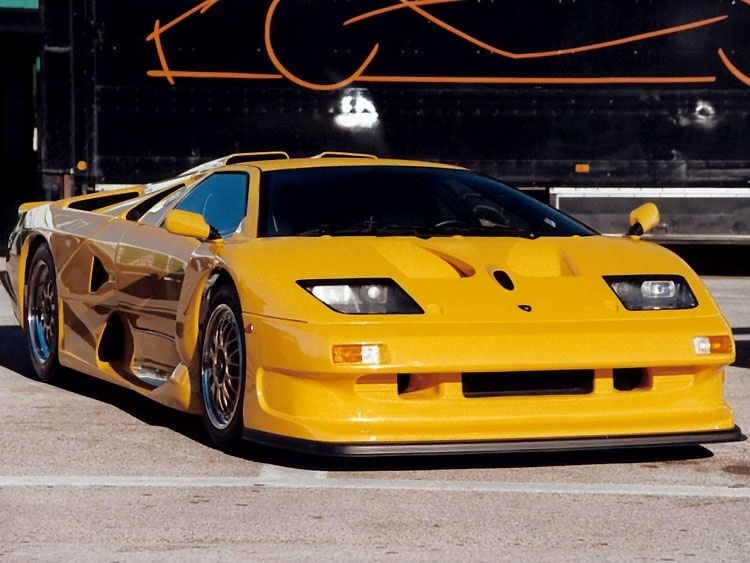 The Lamborghini Diablo GT1 was a very strange car which ended up in an even stranger land. Built to take on the weaponized sportscars of the FIA GT Championship on the wide open spaces of European circuits like Le Mans, the car failed to make the cut. SAT retained the Stradale after cancellation of the project. An unfortunate set of financial and corporate circumstances killed it off before it had even turned a wheel in anger, as MegaTech fumbled and sold Lamborghini off to Audi. The conservative Germans had no qualms crushing Lamborghini’s first official factory racecar since the LM002 Rally, and ended the car’s much anticipated European career in a heartbeat. The French squad of engineers which fathered the V12-leviathan were not keen on letting their creation go to waste however, moving them to proudly provide an extra chassis to the Japanese Lamborghini Owners Club. JLOC ran the car for five season without success, but experienced a great deal of publicity thanks to the car’s alien look and sound. In spite of the turmoil it suffered through during its birth, the Diablo GT1 had finally found its true calling. Like any Lamborghini, it was meant to be loud, brash, eye-catching and occasionally very very fast. Though it was built in the middle of France by decidedly French engineers, the GT1 couldn’t escape the distinctive DNA of its parent. And in doing so, it had dutifully fulfilled MegaTech’s dream of further promoting the brand.